Carl Frampton produced an impressive display in stopping two-time world champion Steve Molitor at Belfast's Odyssey Arena. 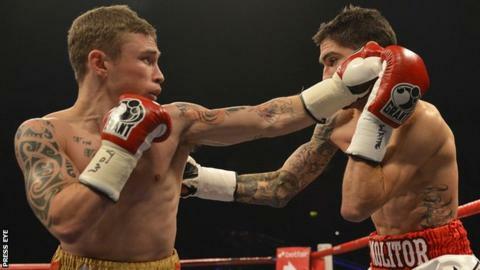 Frampton was on top of the experienced Canadian from the first bell and was declared winner deep into round six. The win saw the exciting 25-year-old Frampton retain his Commonwealth super-bantamweight belt. It is now 15 wins out of 15 for the highly-rated Belfast man, keeping him on course for a 2013 world title bout. The manner of the victory should move Frampton up to a higher level in a competitive division. Molitor was floored three times before the bout was stopped and he was simply worn down by a younger, superior fighter. Frampton said he was ready to take on England's Rendall Munroe or Scott Quigg. "I will fight anyone. I am ready for a world title fight," he said. "The crowd was amazing tonight and I would love more fights in Belfast. "Scott Molitor was a world-class opponent. I knew it was a big test and I think I passed it with flying colours. "I knew I had to push it hard from the start." Early, Dungiven's former European light-welterweight champion Paul McCloskey revived his career with a points win over American Manuel Perez.